Eschewing a fancy remote control, ornate voice interface, or complex apps, Roku’s biggest product launch emphasizes straight-up TV watching. Roku, which made the first successful streaming TV box back in 2008, has its biggest product launch ever today. Its five new models include TVs ranging from tube sets to high dynamic range, 4K/UHD screens. Along with the revamp of its Streaming Stick in April, Roku has had a complete product turnover in just the last six months. The $30 Roku Express, looking like an old Roku 1 model sliced in half, is its cheapest player yet, supporting video up to 1080P HD. For $40, the Express+ includes the analog ports from the old Roku 1, which used to cost $50. Priced at $80, $100, and $130, the Premier, Premier+, and Ultra models all offer 4K streaming, without the noisy cooling fan of the previous 4K model. Yet Roku’s remote controls for the new models have the same bulky, almost-child’s-toy design from 2011. That simplicity is deliberate, and a reflection of Roku’s overall no-frills approach to the streaming TV business. “In a combination of form and function, we tend to lean a lot more towards the function,” says Lloyd Clarke, Roku’s director of product management. The big buttons and deeply contoured purple directional pad are easy to find just by feel, says Clarke. “I see other companies move away from simplicity, trying to get to some overly sleek design,” he says. Clarke might be referring to the Apple TV and Amazon Fire TV product lines—two of Roku’s biggest rivals. Streaming TV devices (including smart TVs), are now in 50 million U.S. homes, according to market research firm NPD Group. “This is no longer an early-adopter market, we’re talking mass-market offering,” says analyst John Buffone, who’s been tracking sales and surveying owners of connected devices, as NPD calls them, since 2012. Roku seems to be focusing on what the mass market is looking for by following market trends rather than the early adopter buzz common among its neighbors in Silicon Valley. Apple’s cheapest model costs more than Roku’s new flagship player, the $130 Ultra, which streams 4K/UHD TV in high dynamic range (HDR) at 60 frames per second. That’s the top quality offered by Netflix, the top streaming service, which Roku spun out from in 2007 and with which it still shares an office complex. Apple’s pricing is based on the amount of storage (32GB and 64GB) because, as the company says incessantly, the future of TV is apps. Perhaps, but the present most certainly is not. “Consumers don’t use connected TVs or attached content devices for much other than watching TV. This trend has not changed in years,” says Buffone. Roku offers about 160 basic games controlled awkwardly via its unglamorous remote. Amazon Fire TV and Apple TV offer well over 1,000 games, and each company sells a $50 Xbox-style wireless game controller. But few people are looking for games on their streaming box. Just 9% of people who own internet-connected TVs reported playing video games in NPD’s latest survey in the second quarter of 2016. But 67% of those people watched streaming services. “Primarily, people watching TV are looking for the best picture,” says Buffone. “The attributes that we’re seeing in the marketplace as most salient [are] 4K and 4K HDR.” That’s where Roku goes big. Along with the Ultra, Roku’s Premiere and Premiere+ support 4K/UHD at 60FPS. (The Premier+ also handles HDR.) Amazon’s $100 Fire TV supports 4K but only up to 30FPS, and without HDR (although an upgrade may be be coming). Roku doesn’t skip the low end, though, with analog jacks on the Express+ for tube sets. These aren’t the future of TV, but they’re still part of the present. U.S. homes with connected TVs have an average of three sets, but only two that are online. “Those 50 million homes represent another 50 million TVs that could be connected, and a lot of them are old-school tube TVs,” says Buffone. Neither Apple TV nor Fire TV, nor Google Chromecast have analog ports. tvOS is taking a step forward with updates to Siri, and new features such as single sign-on, dark mode, and more. Although the streaming-box industry is booming, it won’t last forever. Most new sets are smart TVs that don’t need a smart box. In 2014, Roku started licensing its software to smart-TV makers. Roku’s OS will be in “nearly 100” TV models this fall, says Matthew Anderson, Roku’s CMO. They tend to be from budget manufacturers like Haier, Hisense, TCL, and Best Buy’s Insignia brand. Sharp uses the OS in some budget models, and Hitachi will soon join in. They’re not the most glamorous smart TVs, but they currently include the first, third, and eighth best-selling models on Amazon, as well as the second and tenth most popular on Best Buy’s website. Along with quality, which shoppers tend to measure in specs, consumers are looking for the most content, says Buffone. Roku wins here, with more than 3,500 streaming channels, including ad-supported ones that bring in extra revenue for Roku. In June comScore reported that Roku accounted for 49% of the set-top boxes people used for streaming in the U.S.—followed in order by Google Chromecast, Amazon Fire TV, and Apple TV. Roku’s search covers over 100 of the top online channels like Netflix and HBO Now. Roku does promote the movies and TV shows that it offers in a revenue-sharing deal with Fandango—on its home screen, not in search results. But the house brand doesn’t overwhelm Roku’s interface as much as it does the Amazon Fire TV’s. Nor does Roku lock out popular channels, as Apple TV does with Amazon Prime Video. Roku hasn’t upgraded its voice search, which sticks to the basics, responding to the names of a movie, TV show, actor, or director. Amazon and Apple have powerful in-house voice recognition and AI engines, Alexa and Siri, to draw on. They can do extra things like tell you the weather forecast (Fire TV) or handle complex queries like “find comedies from the ’80s.” (Apple TV). But most people are looking for the basics, and voice isn’t near the top of the list for most people shopping for video streamers, says Buffone. Roku does win acclaim for its visual interface. 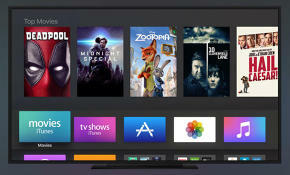 That it’s essentially unchanged in this new product revamp is a testament to the work done back in 2013 under Ali Vassigh, who left Microsoft’s Xbox team to become Roku’s director of user experience. The new look his team built is based on a two-column layout; large, gorgeous icons; and relentlessly consistent navigation. “You’re going to scroll up and down for the choice you want, and when you pick it, you’re going to move to the right to get closer to accomplishing your goal,” says Vassigh. However far down you dig, hitting the Home button on the remote makes the entire interface appear to slide from left to right, physically retracing the path back to the home screen. That took a lot of coding, says Vassigh, but he insisted on showing movement through the levels of the interface. “I want you to feel like this is real, like these are real places that exist,” he says. Instead Roku users mainly thumb around with a big purple button on a chunky remote control. And more people seem to be using Roku’s simple controls to navigate its vast, straightforward video offerings than are using any of its rival streaming boxes.